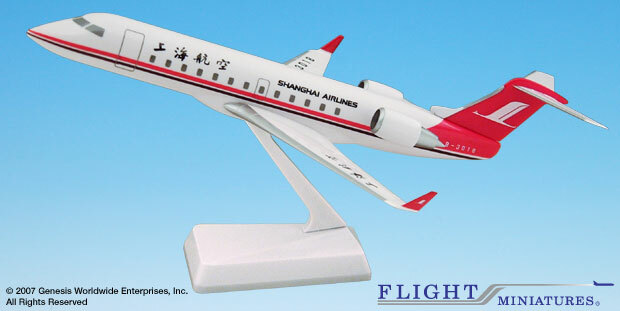 This model represents ship B-3018, the first Canadair CRJ-200 to be delivered to Shanghai Airlines. It was delivered to the airline on November 30, 2000, the airline currently operates five CRJ-200's in its fleet. The 50-seat CRJ-200 regional jet, powered by two General Electric CF34-3B turbo fan engines, has an operating range of up to 2,005 nautical miles, with a 41,000 ft service ceiling and maximum speed of 0.81 mach (550 mph). Established in 1985, Shanghai Airlines is the first commercial airline with limited liability in China, being responsible for its own operational profits and loss. The airline is one of the largest regional air carriers in China with over 130 domestic routes.